Data from the most recent Vividata study confirms that print newspaper readership is still dominant in major Canadian markets. 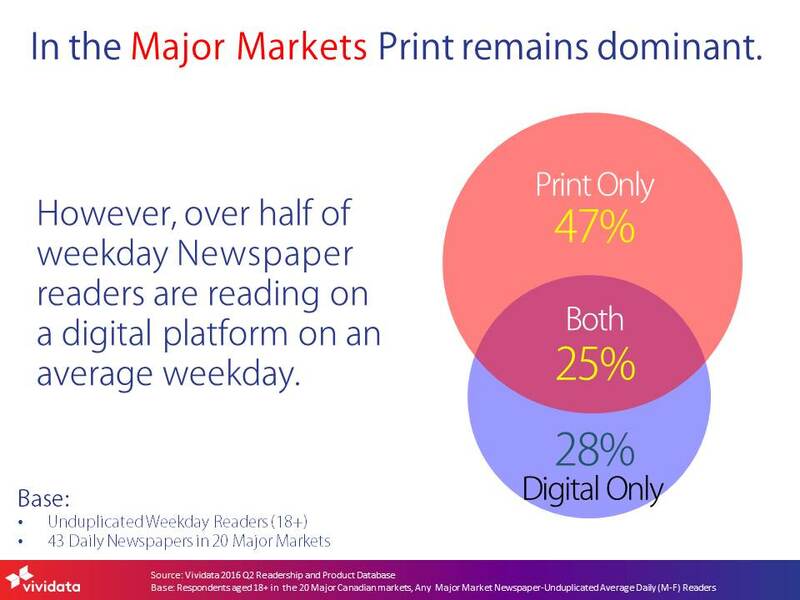 Almost three quarters (72 per cent) of weekday readers are reading a printed newspaper, although some of these readers are also accessing digital content. Digital reading continues to gain momentum with more than half of weekday readers (53 per cent) accessing content via digital devices. Not surprisingly, the average age of print readers (50 years old) is higher than the average age of digital readers (44 years old). For more information on daily newspaper readership in Canada, visit https://vividata.ca.